Often times as a content creator, I struggle with narrowing down my focus. I know it's not just me because I can see it happening. If you've run into a professional business account like Nike or Forever 21 you can see what their focus is very clearly. However, when people are just starting out, you can tell that sometimes they don't always have a clear vision. Either that or they haven't even found their focus yet. One second it will be make up, the next it will be fashion and accessories, and the next day it could be all shoes. Which isn't a horrible thing if your focus is a certain type of fashion, but I hope you can kind of see where I'm coming from. It's unprofessional to have your page, website, feed, etc. be all over the place because... well... that means your brand vision is all over the place. Don't get me wrong, I notice myself falling down this path quite a bit, but I am always able to get myself back on track. 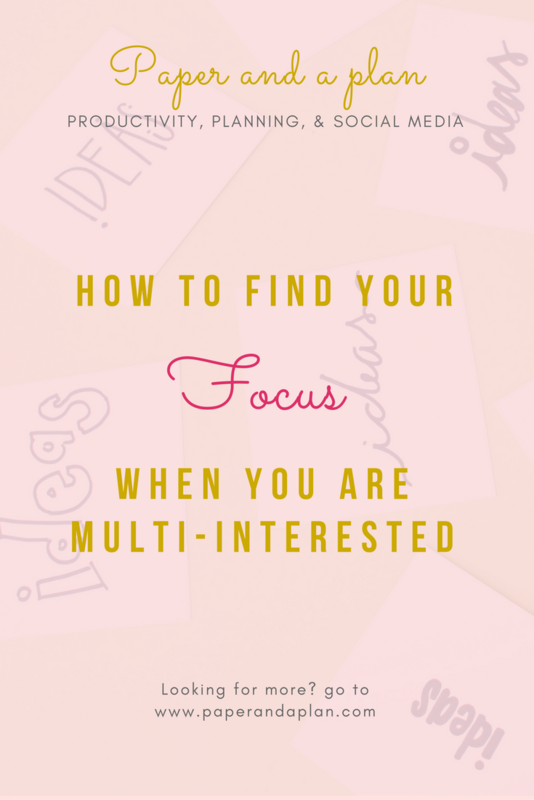 The real question that will be answered today is: How exactly do you find your focus when you're multi-interested. Being multi-interested isn't a bad thing at all. It just means you're interested in a bunch of stuff. I am EXTREMELY multi-interested. However, it was all about finding my passion. What I truly loved to talk about and do. Seems pretty self explanatory right? This is one of the most important steps in the process believe it or not, and you'll be able to see why later on. You can do this on a google doc, on your phone, on paper, whatever helps best honestly. Anything you can think of that you're interested in making videos about, blogging about, teaching, or whatever your platform is going to be is going to be written down. Keep in mind you want to have a mental note of a few things you would ultimately love to do for a really really long time. Go do that NOW! Would I be able to talk about this every single day and still love it? Is this topic something I am passionate about? Do I get excited just thinking about it? Will focusing on this topic bring me a sense of fulfillment? In other words we all choose what we do for a reason whether its teaching, helping someone in need, etc. Would you be satisfying this? Is there topics closely related to each other on the list you wrote? Is there any topics you realize are more of a hobby than an actual passion? Is there another way you could talk about one of these topics without it being your main focus? for example could you just make a fan feed on Instagram, or could you make a totally separate blog or YouTube for this? Remember to be completely honest with yourself. I actually did these steps myself and asked myself these same questions. Turns out I wanted to help people become more productive. I noticed a ton of people who had horrible time management skills, weren't prepared, didn't respond on time, didn't meet deadlines, were always late, etc. I thought to myself "well, there really isn't anyone to teach this, and this is a huge life skill! Not only for the fellow content creator, but people in general." I realized that my love for planners could be combined with this, and that my love for video games and pastel colors could have it's own fan Instagram account which I am doing just for fun. Go through your list and cross out any of your topics that you feel aren't going to meet the requirements of your focus. By asking yourself those questions, you should have been able to figure out what topics were absolutely not going to make the cut. Whether they were more of a hobby, or they just simply weren't going to satisfy your needs. It's totally okay that everything isn't going to work out. By the process of elimination you should have found your focus. Keep in mind if this isn't working out for you, then you could always switch to your secondary focus and start fresh. However, like I keep stating, you should have done some hard thinking and came to a decision on your main passion. If you really couldn't narrow it down, see step 5. There is still some hope for you, but only if your remaining topics relate to each other. Which often times they will if you did a good job eliminating. For example my final 3 are literally what you see in my blog. Productivity, planning, social media. All 3 of those things I absolutely loved. However I found a way to combine them all so that it worked. I can teach people the importance of planning on my blog, while my YouTube is the more creative side of planning. Productivity is the main focus of my blog and it's dabbled into my YouTube. Social media strategy and branding is a big part of my blog, and I have some graphic and editing tutorials on my YouTube. Everything ended up mixing together perfectly, and all of the information I share can help both content creators and every day people. It was a win-win for everybody. Get creative with this part! Maybe you love fashion and food. Food fashion? Styling food? Fashion with food snuck into the picture? Let your imagination take over and you might end up creating something totally new that people will love. What is your focus? Leave me a comment! My Motivation Totally Tanked. Here's how to get it back.